Water fountains for cats? Why? Cats need fresh water to stay hydrated. This helps reduce urinary tract infections and ensures proper kidney function. Bladder stones can be caused by a number of things, one of which is not drinking enough water. Encouraging your cat to stay hydrated can save you from future expensive vet bills. If you’re wondering why cats might drink more out of our water fountains, there’s one primary reason: cats are naturally reluctant drinkers, and that can be detrimental to their health. House cats are descendants to wild cats and wild cats in nature prefer running water. That’s because running water tends to be cleaner while standing water can be brackish and kind of nasty. So your everyday house guys kind of have the same feeling and tend to like moving water more. The Catit cat water fountain has three appealing water flow settings to satisfy picky drinkers, with a fresh new look and a brand new flower accessory. Your cat may prefer a sizeable water-to-air surface or long streams of water with a bubbling top. And if that’s too exciting, just add the flower bud: quick and easy! This cat water fountain takes up little floor space, and its opaque design keeps water fresh for longer. Its raised, ergonomic drinking surface is at a comfortable height for adult cats and kittens. The unit is sturdy and has good weight; it is not easy for a cat to tip it over, especially if there’s water in it. The Catit water fountain has a large 100 fl oz water reservoir that holds a dual-action water softening filter. This filter removes excess calcium and magnesium from hard tap water, while retaining stray hairs, sediment and debris for optimal purification and pump performance. Cats have a very developed sense of smell, so this filter also removes unpleasant odors from the water, caused by chlorine or bacteria. Unlike bowls, where the water just sits, the Catit Fountain circulates the water around, cleaning and aerating it and giving it a fresh taste. The Catit Flower Fountain comes with one water filter. 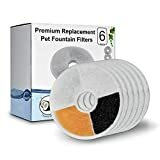 You can find the Catit replacement filters online, but it is also possible to use other compatible filters, which are much more affordable. We recommend the Youthink filters, which are made of Polypropylene Cotton and come in a handy six-pack. Take the flower off. There will be a small bubble of water where the cats can drink, and the water will gently flow across the surface. Leave the flower on without the top yellow part. This simulates a faucet-like stream. Leave the whole flower so the water can come up and trickle down. When you leave the yellow part off, the water creates a bubble effect. Some cats enjoy this, while others get distracted or start to play with it. Putting the complete flower on keeps the bubble away and lets your cat focus on drinking. Just try and see which one your cat feels more comfortable with. This cat fountain is not very noisy; you can barely notice it when it is on, and it kind of blends in with the noises of the house. The Catit Flower Water Fountain includes a power cord that is about 6 feet long, and you must keep your fountain plugged in all the time to maintain the water circulating. Cleaning is as easy as can be; it takes less than a minute to take it apart. Just pop it open and give it a rub down. A weekly wash and rinse with a sponge are recommended. You should also rinse the filter, but never use soap on it. If you notice the filter is getting very dirty and it is hard to clean, its time to replace it. Seeing debris in it, like food or hair, is an indication that you should change it. Usually, this is necessary every three to four weeks, but it all depends on your home’s environment, as well as how many pets you have. If the pump seems dirty just open it up, remove the impeller, and clean it with a cotton swab. The impeller is delicate, so handle it with care. The Catit Flower Fountain: simple, compact, and a 3-in-1 drinking solution.